I.D. 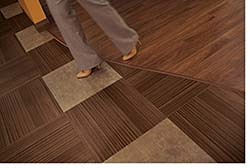 Freedom is a range of luxury vinyl planks and tiles that come in a variety of sizes with a range of looks including wood, stone, and abstracts, for a total of more than 90 SKUs that coordinate together. Features a hard-wearing reinforced polyurethane surface treatment, 20mil wear layer, and 1/8-inch gauge.